Something I have come to understand in the world of pets is this – our animal friends not only have their daily routines, but many have a job or responsibility in their family home. This can take the form of a living room alarm clock, as pets often feel an obligation to get their owners up on time in the morning, even on weekends. Landscaping is also a popular vocation; particularly pruning flowers and digging holes (not always where planting is supposed to occur). Home protection service is a specialty of many canines. whatever the job, it is usually taken very seriously. Neo, a Jack Russell Terrier mix, is being prepped for surgery. He is an ambitious young dog with big plans. Neo has the distinction of being the family greeter. Perhaps he takes this little job a little too much to heart. 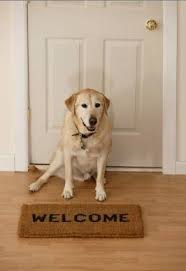 The house rules dictate that he must be the first member to greet all visitors. On this occasion, it was felt that for his own safety, he should be held so he could not escape to the outside. Neo, however, was not to be denied. He flew out of the arms that were holding him. However, he didn’t stick the landing. The x-rays showed the unfortunate result of a completely broken limb. His family understands his commitment to his job, but he is now on the disabled list but retains full benefits and remunerations. the break was repaired with a stainless steel plate and screws ensuring a successful return to the workplace.